Antisense targeting proprotein convertase subtilisin/kexin type 9 (PCSK9) - involved in the metabolism and cholesterol and LDL. PCSK9 breaks down the receptor that binds to and captures LDL particles...so inhibition results in more available receptors to eliminate LDL-C from the blood. 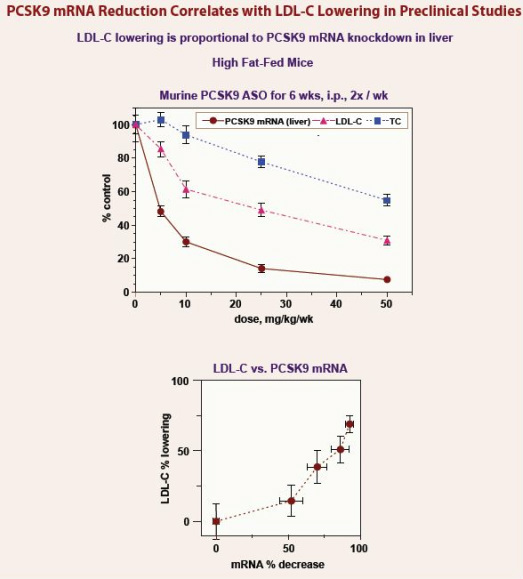 Human levels of PCSK9 correlate with LDL levels. Click here for a nice Reuters piece on PCSK9 and its discovery as a cardiovascular target. The PCSK9 program was featured on this poster at the 6/2011 Annual Meeting. no fatty liver seen to date in animals. first generation antisense approved in 1998 by FDA for treatment of cytomegalogvirus (CMV) retinitis in AIDS patients. private-spun out from ISIS 10/2007, ISIS owned ?? (<10% at wind-down). AIR645 - 2nd gen antisense for inhaled therapies. Earlier pgm targets not disclosed.